This fine and impressive 1970's diamond ring has been crafted in 14 ct yellow gold with an 14 ct white gold setting. The central diamonds are flanked to the upper and lower borders by a row of four pavé set modern brilliant round cut diamonds which complete the overall design. The subtly tapering 14 ct yellow gold ring shoulders blend seamlessly with the plain ring shank hallmarked to the interior with '04' and 'B', and the 14 ct gold fineness mark (585). Due to the style of this ring there is a strong probability of German origin. 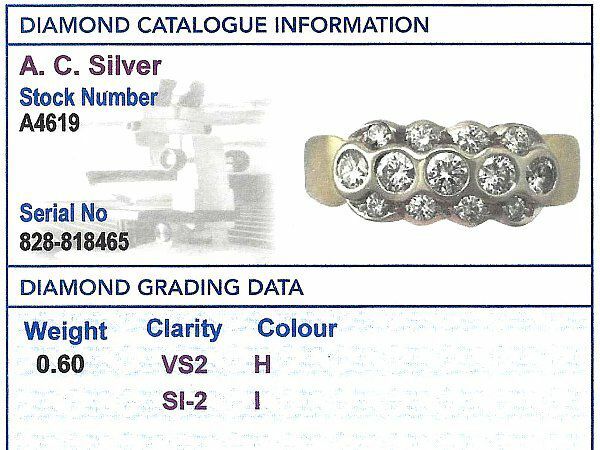 This vintage diamond ring is supplied with an independent diamond grading report card. 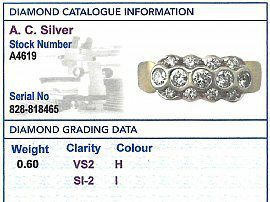 This impressive dress ring is fine quality set with very high colour graded diamonds. The ring is a very good gauge of gold and is in excellent condition with clear hallmarks to the interior of the ring shank. Reflections in photographs may detract from the true representation of this fine example of 1970's jewellery/estate jewelry.